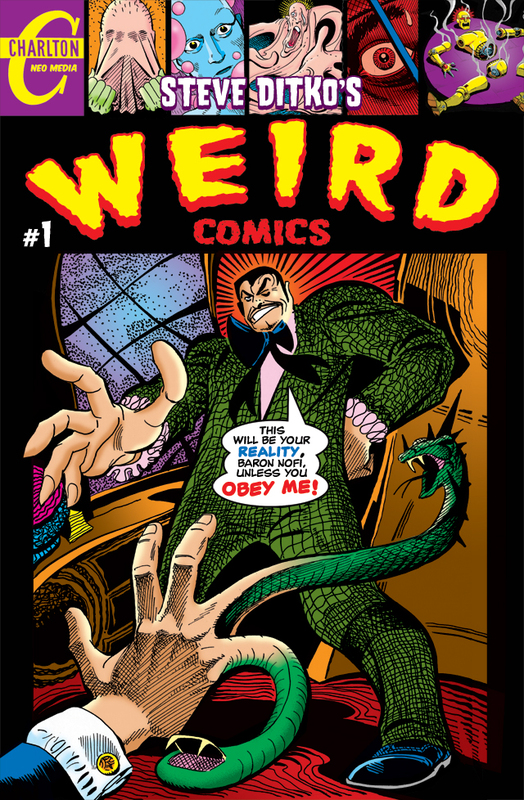 Now available from Mort Todd's "Charlton Neo" imprint is STEVE DITKO'S WEIRD COMICS #1, a colour collection of the five short stories that Steve Ditko created for the Todd-edited MONSTERS ATTACK (see here for posts on some of those stories in their original black and white incarnation). 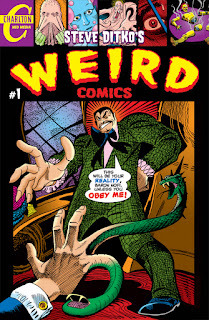 A total of 27 pages of Ditko written and drawn stories (one inked by Mort Todd), reprinted and coloured with Ditko's permission. It's available as a print-on-demand comic from Amazon or a digital edition for the Kindle. Note that if you prefer the stories in black and white the story "The Creator" is available in the recent TALES OF THE MYSTERIOUS TRAVELER #16 from Snyder/Ditko and Todd has announced plans for a more comprehensive collection of MONSTERS ATTACK stories (including work by John Severin, Gene Colan, Alex Toth, Pat Boyette and others) sometime in the future which will have the stories in their original form.